SANSON - Gouvernem.t du Languedoc..
SANSON,N. / MARIETTE,P. - Gouvernem.t du Languedoc..
Gouvernem.t du Languedoc.. - SANSON,N. / MARIETTE,P. Map maker : SANSON,N. / MARIETTE,P.. Size : 20.9 x 16.2 inches. / 53.1 x 41.1 cm. 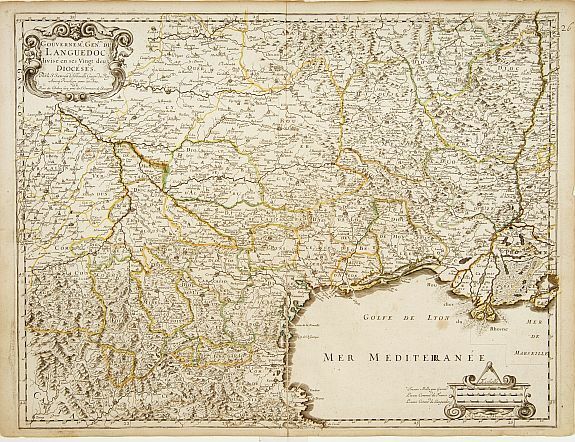 Description :Fine map of south-eastern part of France (Languedoc Roussillon), including the towns of Montpellier, Toulouse, Avignon, etc. This edition carries the date 1651, engraved by R.Cordier. Condition : Good and dark impression. Repair of split lower part center fold, 10cm. into engraved area.